Alejandro Monteverde is a pro at making little things big. He’s the voice and direction behind the magic of Bella, a small-budget film that surprised even him by winning the biggest award at the Toronto Film Festival in 2006. 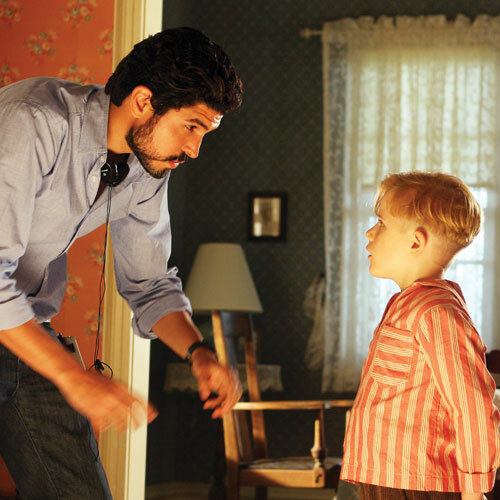 Monteverde’s second film is Little Boy. It may also be a small-budget film, but it boasts some big talent: Oscar-nominee Emily Watson, Kevin James and Golden Globe-winner Tom Wilkinson. It’s the story of a small boy with a big problem: World War II. His hero dad is fighting in the Pacific. Through his father’s absence, and while the town struggles to accept its only Japanese resident, Little Boy learns a beautiful lesson: If he really wants God to hear his prayers, he must first enlarge his own heart. Monteverde spoke with me about this theme and his faith and film journeys. I wanted to tell the underdog story, and, for me, children are the ultimate underdogs, because they completely depend on the adult world. If they need something or if they want to achieve something, it’s very hard to do by themselves. So I wanted to explore the theme of faith through the eyes of a little boy. It’s about a little boy with a very noble intention. That’s when he discovers the power of faith. There is a passage in the Bible where Jesus says you have to believe like a child. It was a perfect scenario to have a kid who was willing to believe the impossible: In many ways, that’s what faith is. Why, in the film, does the Little Boy perform a list of the corporal works of mercy? Father Oliver [Wilkinson] noticed that there was a little bit of hate in him. He knew he needed to have him work on that, but also to have him realize what faith truly is: It needs to have congruity with your actions. We are called to serve. Eventually, as the little boy starts doing the list, he starts feeling confident and knows that he’s not alone. How do you explore the theme of “love your enemy” in Little Boy? We are called to love our neighbor — no matter what the other person believes. Hashimoto [the Japanese resident in town] and Father Oliver have completely different beliefs. Hashimoto is more interested in the will to power. But Father Oliver and Hashimoto are good friends. There’s a respect for each other. And Hashimoto ends up being the one to help Little Boy do the list. What do you hope to achieve in your films? What inspired you to be a filmmaker? Were you born into the film world or did you get there on your own? I got there on my own. I was born in a small town [in Mexico]. I thought movies were made by the actors. So, like for a Tom Cruise film, I thought Tom Cruise wrote the script and produced it, did everything. When I was 18 years old, I went to Austin, Texas, to learn English. It was there that I saw a film shoot on the street. It really caught my attention because, when I was a kid, around 11 or 12, I would create stories with my toys. My stories lasted for two to three weeks. When I saw the film shoot, it hit me: “Wow! These guys are doing the same thing I used to do, but instead of toys, they’re using actors.” Then I realized you could study that in film school. So I called my parents. For them, it was more about the degree — they didn’t care what I was studying — so they were supportive. Of course, it was close to impossible for me to get in. It was as hard as for Little Boy to move the mountain [in the movie]. I didn’t speak English very well, but, also, it was ridiculously hard to get in. The year I applied, they closed the admissions for an entire year; they had a waiting list. You had to have a 3.5 GPA. My GPA from Mexico was 1.6. It was a really hard journey, but I was able to get in [to the University of Texas at Austin] with a lot of work. What brought you to Hollywood? When I graduated, I had a metanoia, a change of heart. When I was a film student, I explored a little bit the dark side: the parties, the [typical] life of college. The more I explored that life, the emptier I was feeling. So I knew that this was not the path [I should be on]. When I graduated, I went back home to Mexico for three months and recuped and figured out what I wanted to do with my talents. That’s when I met Eduardo [Verástegui].During that transition, I had just graduated, and I had a lot of short films that had done really well, and I was getting a lot of attention — so I knew I could get a career started. But I also was scared [of my choices] because of everybody I was surrounding myself with. My mom used to say, “If you hang out with wolves, you will learn how to howl. So just be careful who you hang out with.” Another way of saying it is, “Friends are like an elevator. You go with them, and they take you two places, either down or up.” I was scared when I graduated because I turned around, and I realized all my friends were into drugs and parties, and I was like, “Wow, I have no friends who can go up. I need to take a break.” I went to Mexico, and I met Eduardo, and he was going through the same thing. He told me, “I’m moving to Hollywood, but I’m a little scared because I don’t know people who want to do what I want to do.” He was in the same boat. He said, “Why don’t you move to L.A.?” So I moved to L.A. and started Metanoia Films with Eduardo. Our first film was Bella; our second is Little Boy; and I just finished the script for the third film. Is it too soon to talk about your next film? It’s in negotiation with a few studios, but I can tell you the theme. The theme of the movie is to explore: Where does evil come from? There’s a lot of debate. Many people say evil comes from twisted minds. Other people say evil comes from a force, an external intelligence — Satan. Every evil thought comes from somewhere. So I decided to explore this from the point of view of an FBI agent who is chasing a serial killer. Where do serial killers come from? There’s a chain. Go all the way back, and try to track [how the evil in their lives evolved]. In Little Boy, Father Oliver tells Little Boy, “Don’t measure yourself from here to the floor; measure yourself from here to the sky.” How do you live that in your own life? I always say this to film students: We always have major barriers when making a movie. Life is never going to be simple — ever. No one person will tell you, “Life is perfect.” No. It is a journey filled with barriers and challenges. Use those barriers as an asset to either make you stronger or to be creative and to figure out a way out. There is a saying that God sometimes takes us to deep waters, not to drown us, but to purify us. Instead of trying to fight it, accept it and understand that maybe it’s an opportunity: To live our faith requires confidence. This article originally appeared in the National Catholic Register on April 24, 2015. It is reprinted with permission and was slightly altered for clarification. Image courtesy of Metanoia Films. Read my interview with Eduardo Verastegui here.